Geotechnical Engineering services encompass all phases including subsurface investigation, geotechnical analysis, evaluation of data, and design of foundation system. EGS geotechnical engineers have provided services for various clients in the institutional, commercial, and industrial fields. SubsurfaceInvestigations involve the examination of soil conditions and properties to aid in the development of geotechnical analysis. 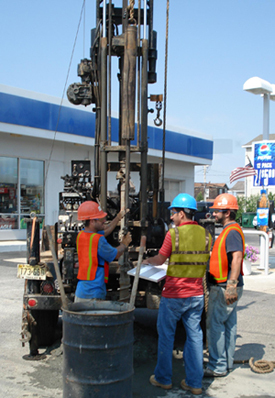 EGS employs drilling techniques and excavation to perform geotechnical analysis and to collect samples for lab analysis. EGS engineers evaluate the generated data to design foundations, retaining and gabions walls, stabilized slopes, groundwater control systems, etc. Geotechnical Reports provide specific calculations and recommendations relating to foundation types, site development, construction methods, allowable bearing pressures, settlements, slope stability, groundwater controls, pavement, land stabilization techniques, landfill remediation etc. Where appropriate, evaluation will incorporate data on effective stress, total stress, consolidation and lateral earth pressure parameters, together with other standard laboratory and field test results such as Atterberg limits, sieve analysis, density and compaction, CBR, and CPT. Soil Improvement / Ground Modifications are commonly required as part of a foundation design project. EGS engineers are experienced in developing the most cost-effective strategies for site preparation to eliminate high construction costs. EGS projects employ various engineering techniques such as pre-loading, geopier systems, grout injections, etc. Construction Monitoring includes engineering inspection and quality control services. EGS field engineers are trained and experienced to handle all phases of foundation and earthwork projects, concrete, masonry, structural steel, and associated material testing. EGS engineer presence on site during construction assures that all work performed adheres to project specifications. Our qualified engineers have expertise in subgrade approvals, site preparation, density testing, deep foundation observation, soil laboratory testing, concrete testing of slump, temperature and air, concrete strength testing, mortar and grout sampling, and asphalt pavement inspection.